Gandhiji started the All India Village Industries Association on 14-12-1934 in the upperroom of Mahila Ashram, Wardha. Dr Josef Cornellius Kumarappa, known for his theory of Economy of Permanence was chosen by the Congress to lead this movement as per Bapu’s wishes. Shri Krishnadas Jaju became its first President. AIVIA had a Board of 18 advisors consisting of distinguished scientists like Dr C V Raman and Dr J C Bose and also many leaders in public life and industry: Rabindranath Tagore, G D Birla, M A Ansari, and Satish Chandra Das Gupta among others. The new processes, techniques and machines were brought to the knowledge of the public through exhibitions. AIVIA also struggled to bring about a transformation in the villages in terms of sanitation, improved diet, indigenous healthcare and local resource based employment. Gandhiji also inaugurated in 1936 the Wardha Haat meant to provide the feel of the market to the producer of village industries products. After Gandhiji passed away Dr Kumarappa became its President and Dr G Ramachandran his Secretary from 1949 up to 1951. The KVIB created , Jamanalal Bajaj Central Research Institute in 1955 – to carry forward the R&D works of AIVIA, From 1st April 1957, the Institute came under the KVIC which was established in 1956 Dr. M S Rao took over as the first Director of JBCRI. To support, upgrade and accelerate the process of Rural Industrialization in the country so that we may move towards the Gandhian vision of sustainable village economy self sufficient in employment and amenities and to provide S&T inputs to make the rural products and services globally competitive. 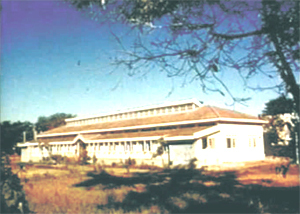 Mahatma Gandhi Institute for Rural Industrialisation at Wardha has been developed during 2000-2008 years by the collaborative efforts of KVIC and IIT, Delhi. It was decided to set up this National Institute at the historical premises of Maganwadi, Wardha. The Cabinet Committee on Economic Affairs, Govt. of India in its meeting held on 28.12.2006 have approved setting up of Mahatma Gandhi Institute for Rural Industrialization (MGIRI) Wardha as an Autonomous body registered under societies registration act .